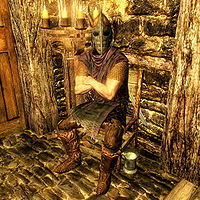 Riften Guard Jailors are Nord soldiers who can be found guarding the Riften Jail, sitting at the jail chair and looking for trespassers. They are replaced by Imperial Guard jailors when the Stormcloaks are driven from the city. They wear the Riften guard's armor and helmet along with a pair of fur boots and a random Amulet of the Divines. They are equipped with the Riften Guard's shield, a hunting bow with fifteen steel arrows, a steel dagger, and a random weapon and shield. They also carry the key to the jail, a torch, a belted tunic, a drink, some food, and some gold change (up to nine in amount). Upon entering Riften Jail, the jailor will walk up to you and say, "Hey, you're not supposed to be down here. Official business only." You have four dialogue options in total. If I Done Got Thaned! is completed, you can tell the jailor that you are a thane, and have him let you proceed. Alternatively, you can walk away from the jailor, who will tell you, "Ignore me all you want, you still aren't getting in." Talking to him again will have him ask, "What are you doing down here?" and you will have the same dialogue options as before. If you have successfully persuaded him to let you pass, he can be heard saying, "The prisoners are in rare form, as usual. ", "Watch your step in here. The stonework gets slippery. ", or "Is it daylight out? Night? I lose track down here." He will also greet you, "A pleasure, thane." if you have completed I Done Got Thaned!. Unlike his Imperial counterpart, the Riften Guard Jailor does not carry a key to the evidence chest. This page was last modified on 2 June 2014, at 11:26.